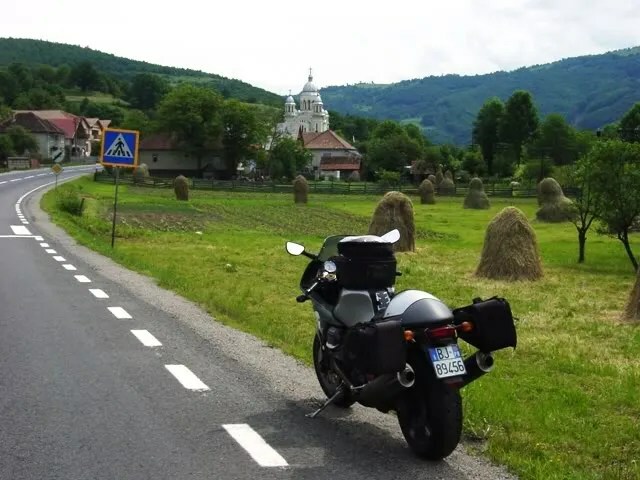 The loosely knit plan was to go from northern Italy over to Romania, hit the Carpathian mountains and follow them back into Slovakia and the Czech Republic, then continue to the UK. Unfortunately, The Alps were between me & Romania. It’s a tough job but, someone had to do it. 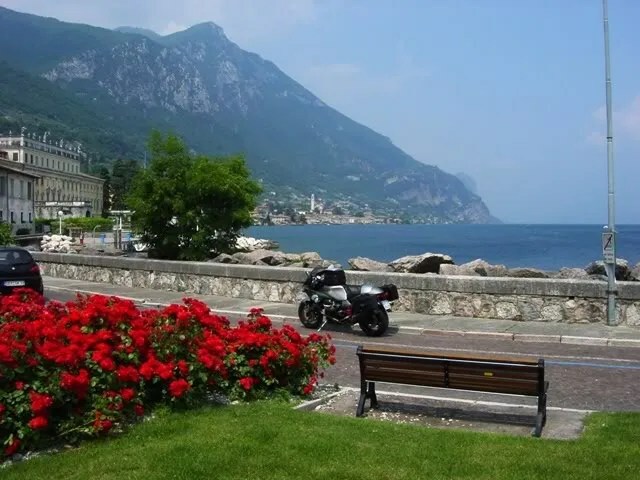 From Parma, I headed north to the south shore of Lake Garda. 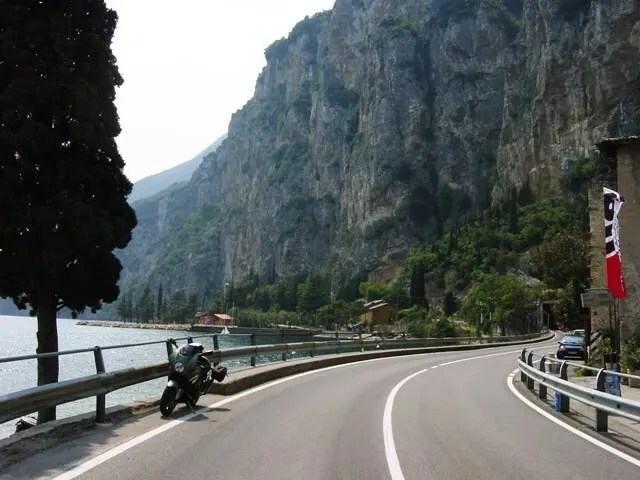 My route took me along the west bank of Lake Garda. Quite an impressive road as it is dug out of a sheer cliff face. About half the time was spent diving into tunnels dug in the cliffside then darting back out into the bright sunshine. Continuing north towards Madonna Di Campiglio, I traversed the northern Italian wine growing regions. If there were ever an Olympics for scenery, Italy would be on the podium every time — my favorite European country. The pic below shows where I will build my house. That will be my driveway and those will be my grapevines and that will be the view that I will wake up to every morning and *pop*…and then I wake up and realize I was dreaming. Especially when I find out a tiny little two bedroom bungalow around here goes for about 800,000 Euros. 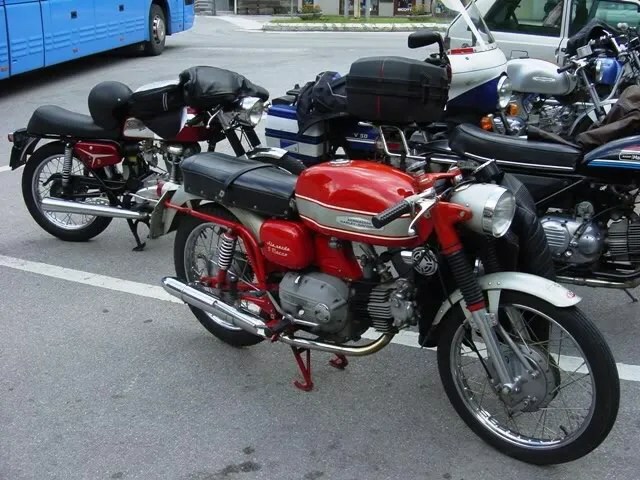 I encountered these Germans aboard Italian Aermacchi-Harley Davidsons at a roadside cafe near Cortina. They were just returning from the Giro d’Italia, held the previous week. 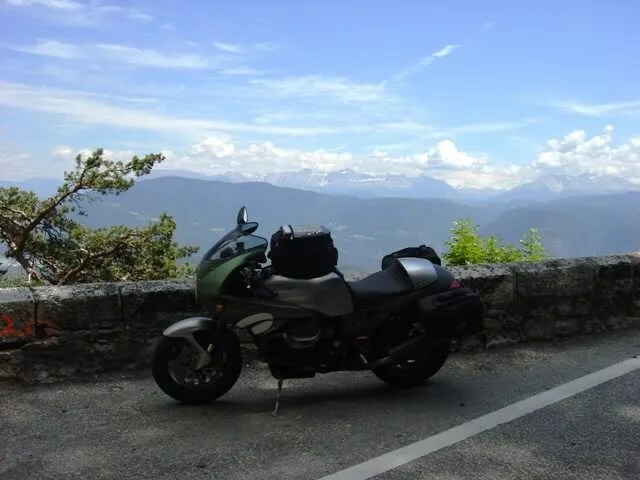 Can you imagine pounding the Alps into submission aboard 175cc bikes? YEEHAW! They told me that their top speed was 130 kph… fast enough to make you see gawd when you went to grab a handful of those drum brakes. 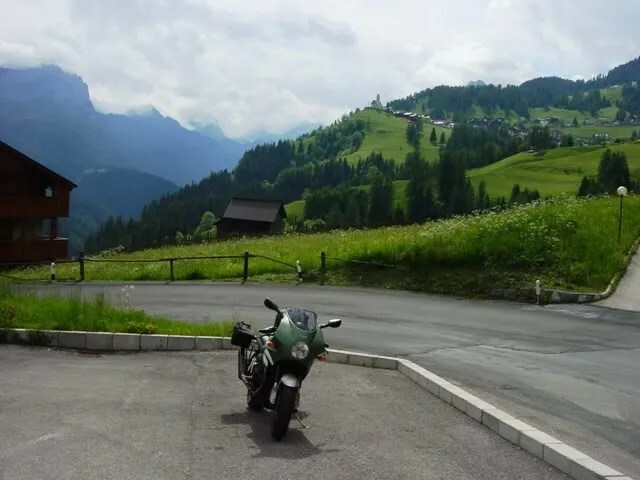 On the second day of my vacation, I proceeded to fight my way through the Italian Alps, bypassing the Passo Di Stelvio because I think that 500 hairpins in 11 kilometers is a wee bit much. Passing Bozeno, I made my way to the chi chi Italian ski resort of Cortina D’Ampezzo. I think Giacomo Agostini has a home here. I got lost, and when I turned around I saw this view. Sometimes it pays to get lost. No matter how many times you see them, the Dolomites never fail to impress. They shoot out of the earth like giant T-Rex teeth ripping the sky to shreds. Did I mention I loved Italy? 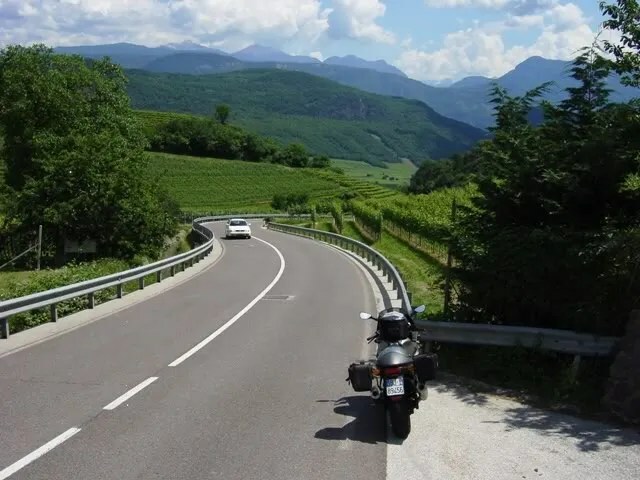 You could spend years between the Alps and the Appenines and never run out of roads to ride. Here’s a typically beautiful Alpine village near the Italo-Austrian frontier. The Süd-Tyrol region was part of the Austro-Hungarian Empire before WW I when it was ceded over to the Italians. Lots of blonde Italians here. Another mountain village. Austria is like some strange other-world where gas station attendants resemble doctoral candidates back in the U.S. Motorists don flourescent orange vests just to change a flat tire. Every valley offers a picture postcard alpine view. It seems almost too good to be true. It makes you wonder what craziness lies beneath the surface of all this perfection. I often wonder if I’d want to live someplace as perfect as this or some chaotic place like Mexico where you can do pretty much what you want… must strike a balance. Coming from the chaos of an Arab country, it’s a bit disconcerting to encounter such orderliness. When I arrived in Graz I saw an information kiosk. I stopped and looked it over. On a wall was a map of the city with little lights denoting the locations of different hotels. When you selected a hotel on a touch screen, a light on the map lit up for the corresponding hotel, and a picture with a description of the hotel showed up on the touch screen. It was almost a bit too much for me to take in. In spite of all this orderliness, I managed to make my way to the Hungarian border relatively unruffled. 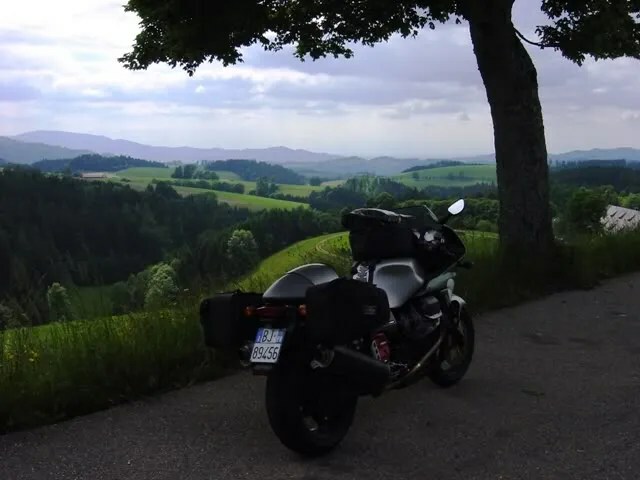 After Graz, the terrain gradually dissolved into rolling hills… not much to write home about sport-touring wise. From the Alps, the terrain generally settled into rolling hills and then into a lumpy carpet sorta terrain. After you’ve ridden through the Alps for a couple of days, everything else sorta pales… still interesting in that never-been-there sorta way. 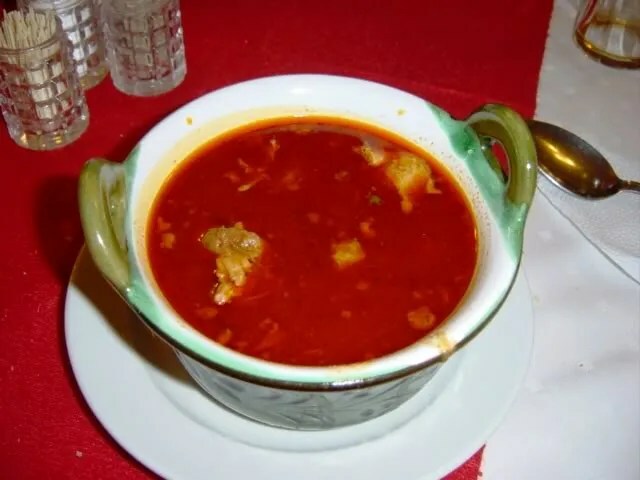 The best Hungarian goulash I’ve ever tasted. 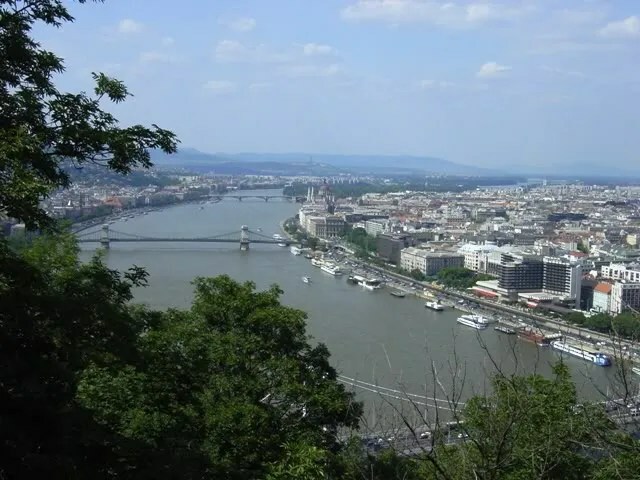 Budapest is amazingly beautiful. The architechture is flabergasting. This place must have survived WW II relatively unscathed. 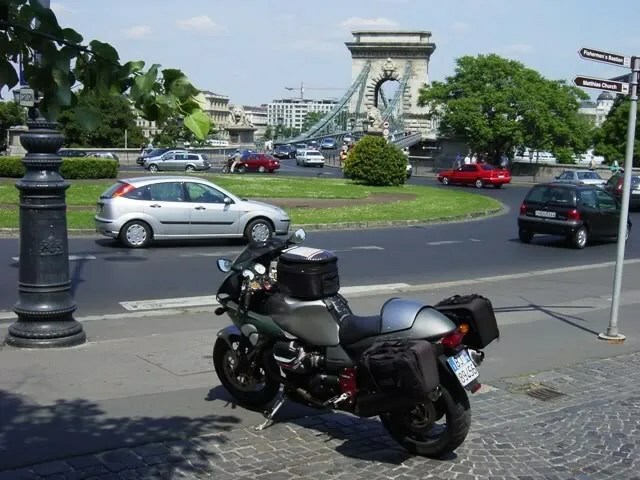 Budapest’s famous Chain Bridge. The architecture is truly mind boggling. So much is lost on modern architecture, though. In reality, nowadays, I don’t think they could afford the craftsmanship that went into these old buildings… sigh. 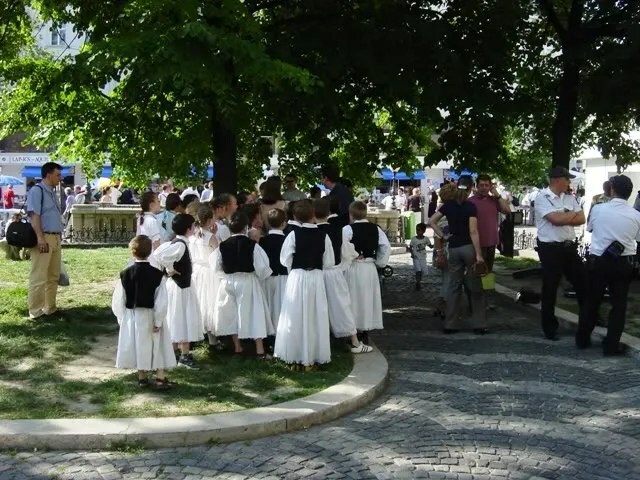 Children prepare to take part in a folkloric dance show in central Budapest. Hungary is truly in a state of transition. You’ll see the latest Porsche pulled up alongside a thirty year old Trabant at a stop light. They seem to be doing quite well for themselves since the fall of Communism. The only bad thing is… EVERYONE seems to smoke! I guess it’s a carryover from the bad old days of communism when things were so bleak that just a hit of nicotine gave someone something to look forward to. 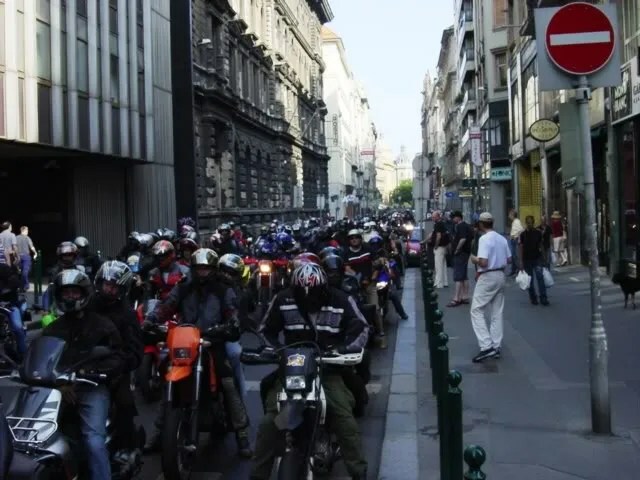 While I was in Budapest, there seemed to be some sort of biker rally going on. Hundreds of bikers escorted by police, made their way through downtown Budapest, honking and waving as they went. I wish I could have joined in, but my bike was back at the hotel. One day from Budapest and I was at the Romanian border. I was a bit apprehensive as I didn’t really know what to expect or even whether I needed a visa. I pulled in behind a Swiss couple in a station wagon who were bringing in aid for an orphanage or something. The customs guy was going through their stuff with a fine-toothed comb. I gulped and waited my turn, trying not to think about the movie Midnight Express. He shot me a gruff look as if to say, What da heck do YOU want? He walked behind my bike and saw the Italian plates and told me to go on. OH! thankyouthankyouthankyou! Yes sir! Vroooom! I was in. I’ve never been anywhere that had such beautifully crafted houses of worship, whether churches or mosques. For such a poor country, the amount of workmanship and labor that went into their churches was impressive. Uhmm…I think I’ll keep moving on. The terrain was beginning to have more hills. The Carpathians couldn’t be too far off. Approaching the city of Brasov, I saw my first glimpse of the Carpathian mountains. Not as impressive as the Alps or even the Pyrennes, but still impressive, nevertheless. 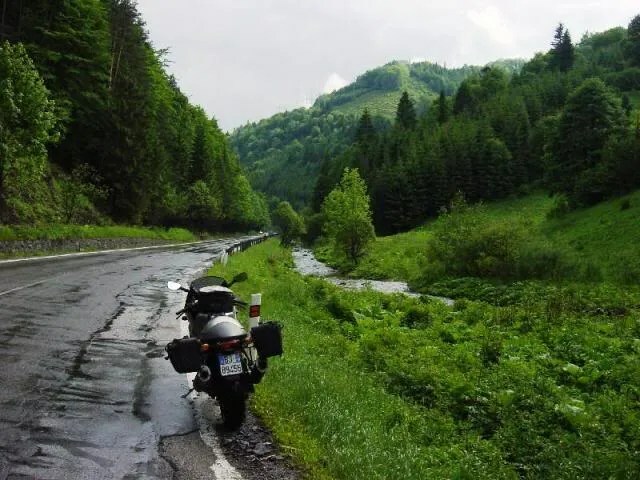 Romanian roads started out ok, and then steadily deteriorated. My last day in Romania I must have averaged 20 kph. Potholes just waiting to strike. Then it started to rain. Oh woe is me. A double whammy. Oncoming cars in your lane weren’t trying to run you off the road… they were just dodging and weaving around potholes. I was dreading a flat or a bent rim, but the mighty Guzzi escaped unscathed. I could just imagine bending a rim then having to hole up someplace while waiting for a new one. Relaaaax…stay another night…it wont hurt a bite…errr…a BIT…it wont hurt a bit. Yeah… uh huh. 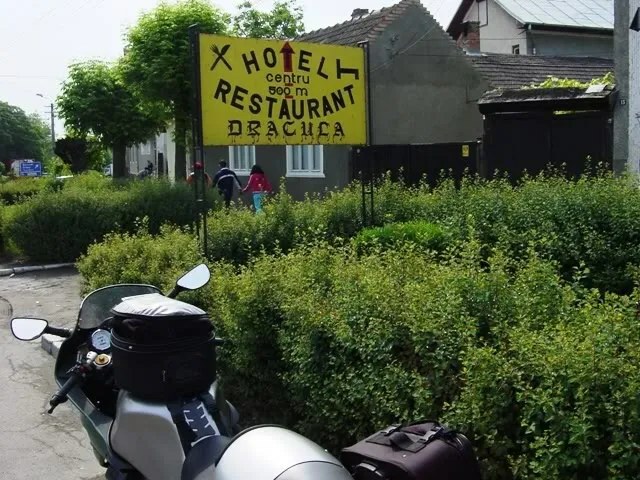 Actually, the hotels in Romania were easily on par with those in western Europe. I was pleasantly surprised. However, their coffee sucked. If there’s a special hell for coffee lovers, it must be something like Romania. I guess it depends on what you’re used to. Romanians may go to Italy and grimace when they drink Italian coffee. Their orange juice, on the other hand, was excellent… freshly squeezed. The terrain was gorgeous, reminding me a lot of the Pacific Northwest. I’d say Romania is 40 to 50 years behind western Europe… probably on the same level as Latin America. Once they get their roads fixed it’ll be a great place to tour. 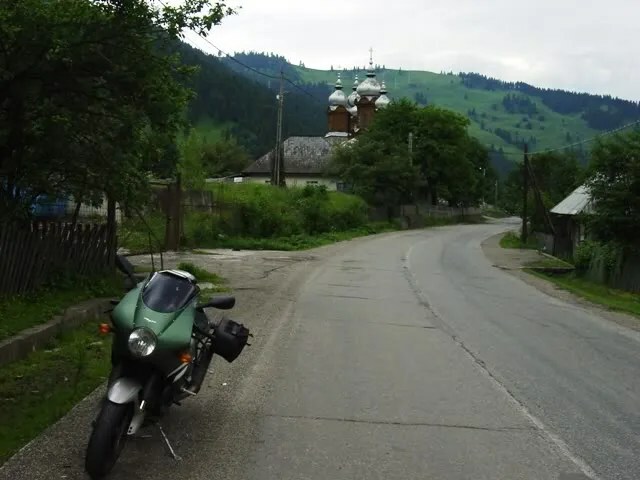 I couldn’t follow the Carpathians into the Ukraine because of visa requirements, so I dodged back into Hungary, then made a quick lunge to the north into Slovakia to rejoin the Carpathians. The High Tatras are the highest peaks in the Carpathian range. This part of the Carpathians is a national park in Slovakia, as well as in neighboring Poland. Unfortunately, the weather still hadn’t improved much, so I didn’t have the opportunity to take any good pictures of the High Tatras. I had one little incident with a Slovakian bus and a mud hole. There was a section of road that had been flooded by recent rains. Off to the side they had constructed a makeshift bypass. The bypass was also muddy from the rains. I had just about finished negotiating my way across the bypass when a bus appeared on the other side. Rather than waiting for me to exit, the “roads” scholar behind the wheel of this juggernaut decided to proceed. In doing so, he cut off my exit line, leaving me only a huge mud puddle to go through. I wasn’t about to risk seeing how deep that puddle was, so I came to a stop. As he came around me, his rear wheels started coming closer and closer. The sides of the bus started to rub against my left saddlebag. I tried to hold the bike up, but I was no match for the bus. Over into the mud went the Guzzi. I managed to not join it in the mud. The bus driver is looking at me in his rearview mirrors as if to say, “wtf are you doing in the mud?” While I was looking at him as if to say, “wtf are you doing driving a bus?” I struggled to lift the Goose and finally managed to extricate it onto dry land. Nobody in the following cars came to my aid. I guess they didn’t want to join the fun in the mud. I was fearing a broken turn signal or a cracked fairing, but I was lucky. Nothing more than a liberal coating of mud. The bike now looked appropriately battle-tested. In all my travels, Slovakia more closely resembled Northern California than any other place I’ve been to. The only thing is, the roads aren’t in quite as good shape. On the plus side, there is less traffic than California. 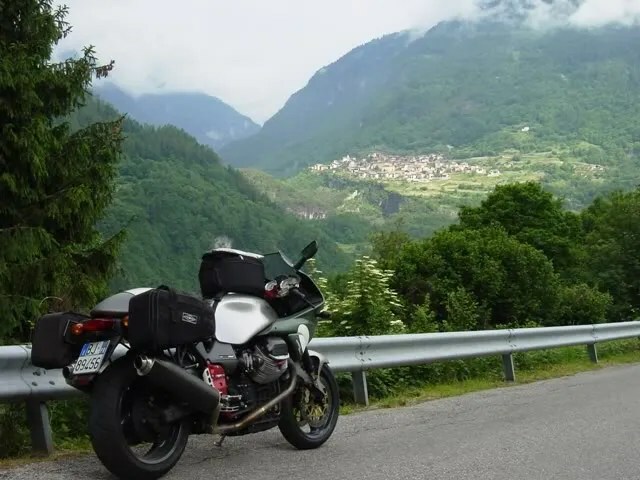 Winding roads going through rugged mountains and following alpine streams make for great motorcycling. 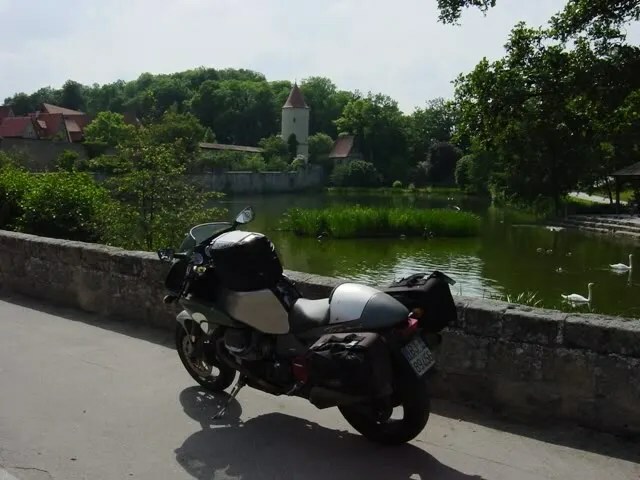 From Slovakia I took a last minute detour into southwestern Poland just to say I’ve been to another country. 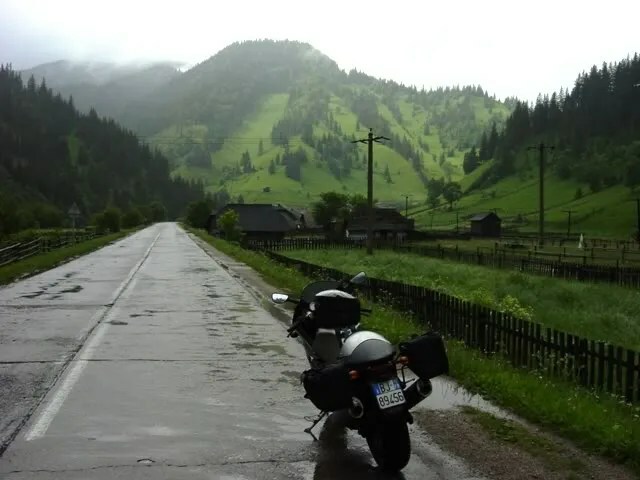 I only travelled for about 100 miles in Poland, but it was nice hilly terrain, making for an enjoyable ride. 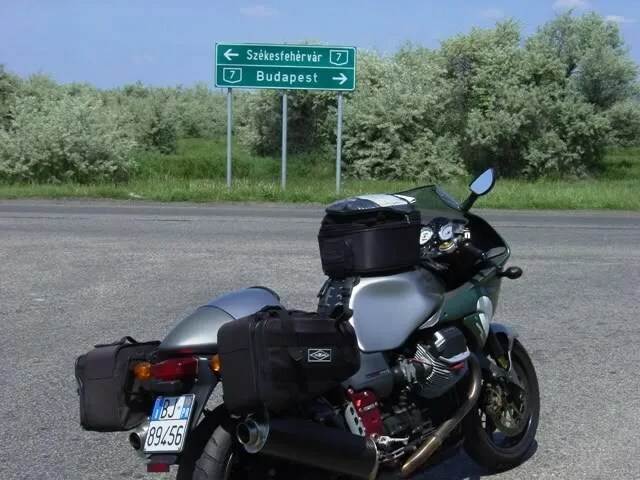 I entered the Czech Republic from Poland. I don’t know what it is, but my Canadian passport freaked out the border guards. They had to take it into the main office and confer with their colleagues. I guess they don’t get many Canadians. Fortunately, I haven’t had any troubles. After a few moments, the passport gets stamped and I’m on my way. Unfortunately, I haven’t been as successful in my money management. I have currencies from five different countries in my wallet. I never seem to spend it all before I’m into another country. It reminds me of the days before the Euro. 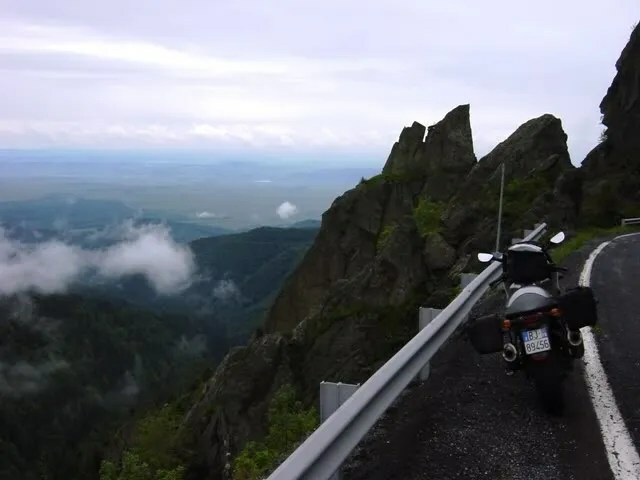 The Carpathian Mountains are but mere foothills by the time they reach the Czech Republic. 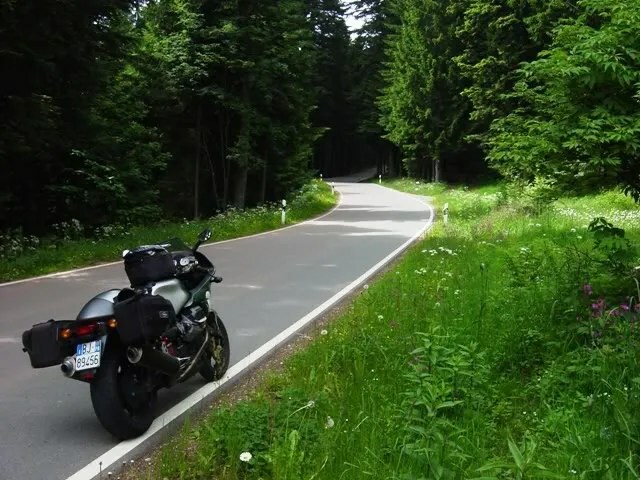 They still make for some wonderful motorcycling roads, though. 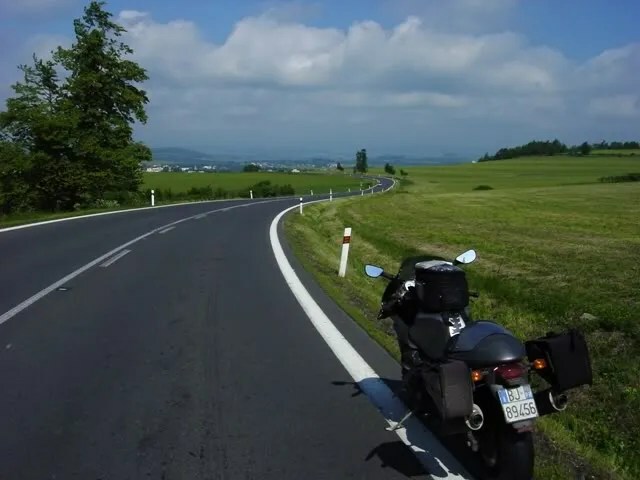 The Czech roads are the best I’ve encountered in the former Eastern Bloc countries. Fast sweeping roads through open hills then darting into dark forests with some occassional tight twisties thrown in… good stuff. I met an elderly Czech gentleman at my bed & breakfast. He told me that he was 15 years old in 1945 when the Russians came and occupied his country. He fled with his family to West Germany where he lived in Cologne. When Communism fell, 40 years later, he returned to his old home town. He went to his old house and knocked on the door. The man who answered the door recognised him and gave him a hug saying, “this is still your house”. It was wonderful talking to this old man. I reminded me of the old John Prine song, “Hello In There”. I’m sure that same story was repeated all over Eastern Europe. 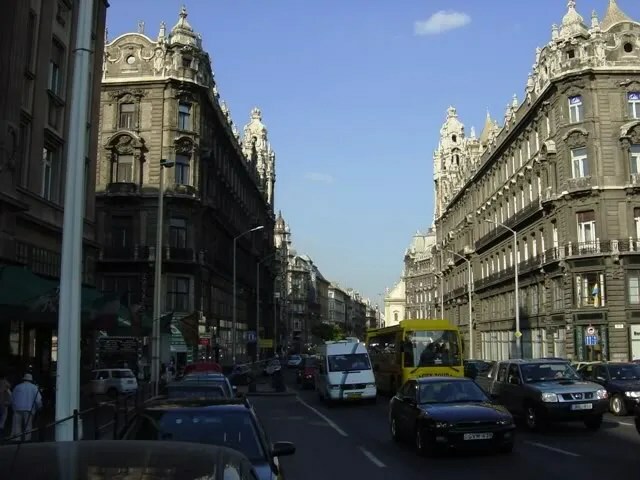 I made my way to Prague, which is similar to Budapest. Both cities straddle a river… both have enchanting architecture. Prague had a few more tourists, though. I took another rest day in Prague. 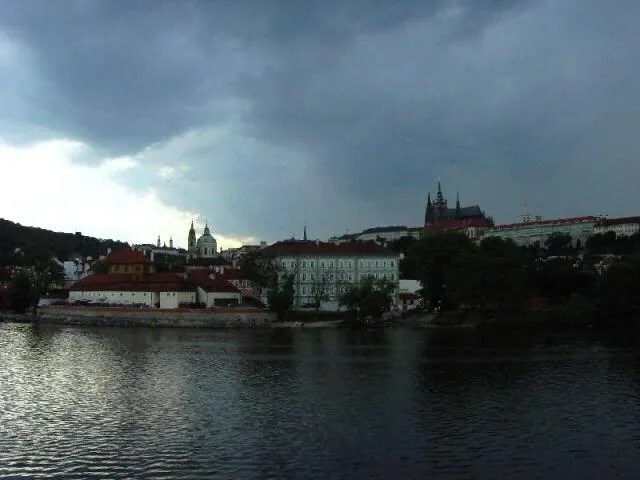 After a couple of days in Prague, I continued westward. I pulled up to the German border entry and received a doleful look. I said, “Hi. I’m Canadian.” The border guard said, “Bye. Go away.” Didn’t even ask to see my passport. I guess they’re not too worried about people on sport touring bikes. I laughed and went on my way. It surprised me a bit. I thought that would be the toughest border to cross. I made my way across Germany to the southwestern town of Freiburg, near the Black Forest. A lot of great riding there. I got lost several times, but didn’t care as the roads were so good. It’s right next to the Swiss border, so it’s in the foothills of the Alps. Right across the French border I noticed all these squiggly lines on the map, so I figured that’s the place I needed to be. 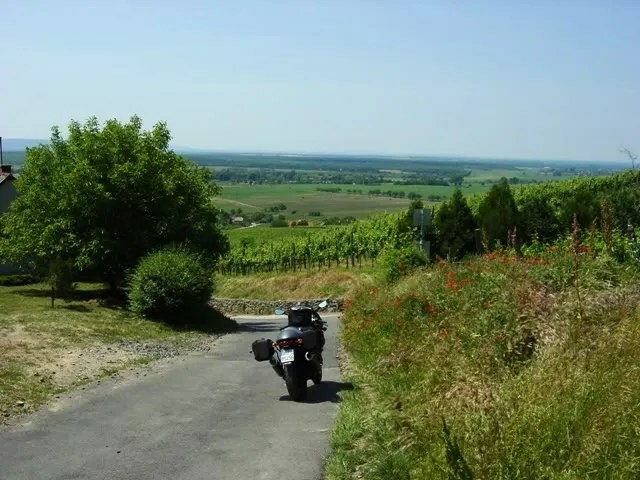 Dang, those French not only know how to cook, but they sure do make some hellacious biking roads. The Germans aren’t too far behind. Scenic village in the Alsace-Lorraine. After working my way north thru Alsace-Lorraine, I re-entered Germany near Kaiserslautern. I must have hit the local biking road because there were bikes all over the place. Excellent roads through darkened forests. From there I worked my way up the Rhine. Great weather on a Sunday… there were a bazillion bikes out. Great views of castles all the way up to Koblenz. 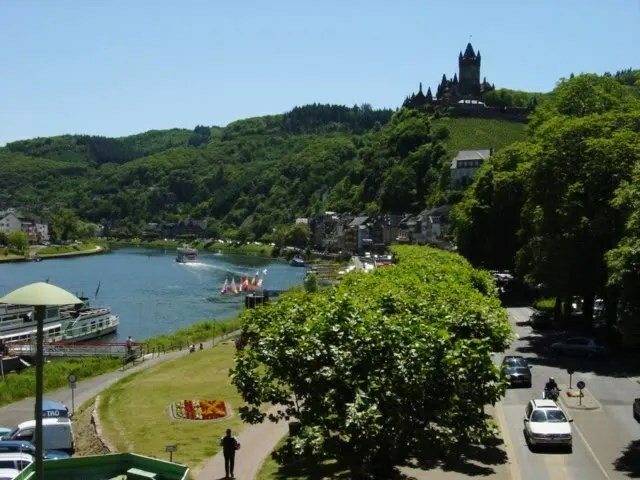 There I hung a left and wandered down the Mosel River Valley, famous for its wines. 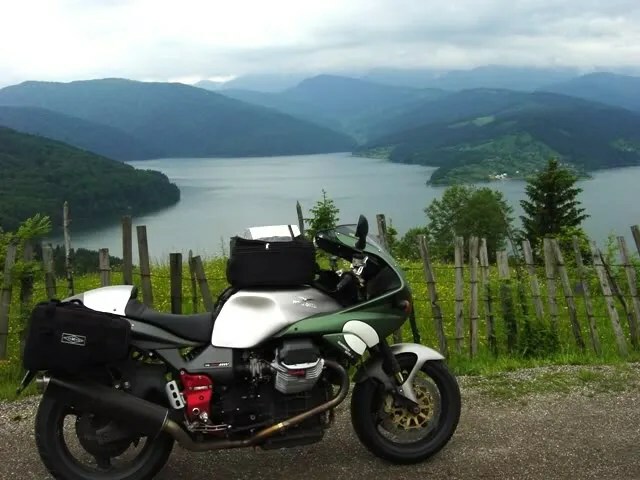 Every tour of Europe should include a ride along the Rhine. There are roads on each side of the river. You can see the castles on the other side easier, but you can’t go wrong on either side. Everyone talks about the Alps, but there’s so much more to Europe than just the Alps. Don’t get me wrong, the Alps are spectacular, but don’t limit yourself to just one area. I finally found a carwash. The Guzzi looked semi-respectable now. I was drinking a soda outside a convenience store…this woman gets out of her car…takes one look at me and my bike…thinks about it for a moment…then clicks on the burglar alarm on her key chain. I kinda liked that. I followed the Mosel River into the tiny nation of Luxembourg. I ended up staying an extra day in Luxembourg. I usually blast through the tiny country on my way to something more interesting. This time I decided to spend a day touring within its borders. What a great choice! Wonderful roads along the Mosel River… other roads wandering through forests so thick that no sunlight penetrated the canopy in spite of it being a scorching day. I’ll defintely have to pay Luxembourg more mind in the future! From Luxembourg I entered Belgium through the Ardennes, passing through many towns whose names recalled the Battle of the Bulge. The Ardennes Forest, haunted by the ghosts of World War II. From France to the English Channel the terrain devolves into rolling farmland. 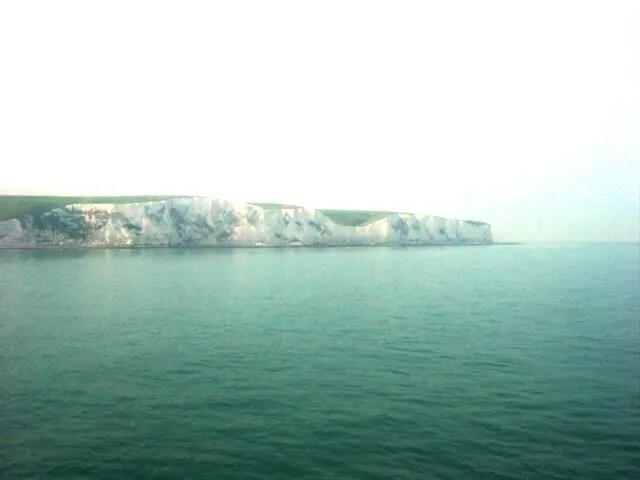 Not too interesting on a motorbike, so I got on the autoroute, blasted to the Channel, and hopped on the 5pm ferry to Dover, where I got a hotel room for the night. Met an old timer on a KTM 900 v-twin modified with a sidecar. He was on his way to an enduro event in Wales. The last day of my trip… and I wanted to make it count. I blasted west on the motorway all the way to Bristol near south Wales. This took up half a day, so I had another half day to enjoy as much of Wales as I could. 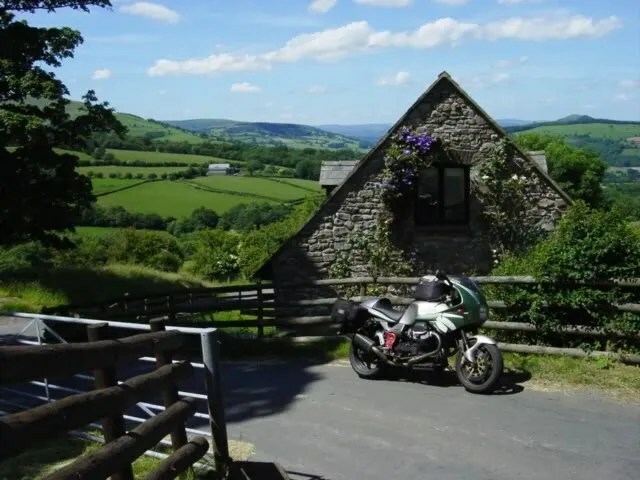 At first it didn’t seem all that special, but the deeper I got into Wales the more I was captivated by its beauty and its GREAT motorcycling roads. I may have stopped to take more pictures on the last half day than at any other time on the trip. Maybe it was the realization that the trip was coming to an end and that stopping to take pictures might prolong it indefinitely. Alas, I reached my friend’s house in Shropshire a little after 6pm, bringing the trip to an end. Here is a shot of the mighty, mighty Goose in the Welsh countryside on the last day of the trip. I can’t say enough about my mount. As a city bike or an every day ride, yes, it may have shortcomings, but as a dedicated sport tourer it’s hard to beat. 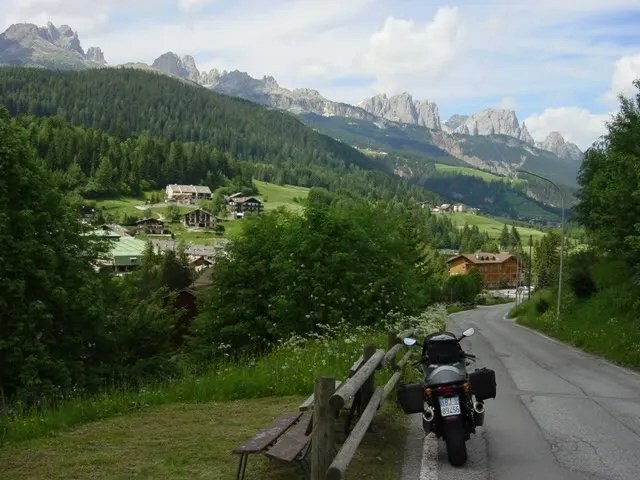 The sound of an Italian v-twin in song as it blasts through a series a curves is one of those things in life that makes the hair on the back of your neck stand up and make you glad to be alive. If you haven’t made plans to sell your current bike and purchase a Le Mans, please proceed to do so immediately. May 31 to June 22. Countries: 12. Italy, Austria, Hungary, Romania, Slovakia, Poland, Czech Republic, Germany, Luxembourg, Belgium, France, England, & Wales. Pucker moments: Many, many minor ones. 0 major. Best T shirt seen: In Budapest, a picture of Che with a joint in his mouth with the caption: “fook the revolution”. Best store name: In Romania I saw a shoe store named Al Bundy Shoes (they get a lot of American TV there).